Mexican Barbacoa: What Is It and How Is It Made? Traditionally, barbacoa is a preparation of meat (usually sheep, goat, or beef) that is steam cooked in an underground oven until very tender and succulent. Today the term is also sometimes used for a similar preparation made on a stovetop or in a slow cooker. Our English term barbecue comes from Caribbean Indian word barbacoa, but despite their common origins, these two words do not denote the same thing. Barbecue involves cooking food over a grill, while barbacoa is a steaming/baking process. Mexican barbacoa is perhaps the most well-known, and its most popular manifestation is that which is used in the central states of the country. A brick-lined oven, usually about 60 centimeters (23 inches) in diameter and about a meter (3 feet) deep, is dug into the earth. Wood is placed at the bottom and burned until the whole oven is red hot. A large pot is prepared with a little liquid (usually water and/or pulque with vegetables and aromatic herbs) and a grille in the bottom so that the meat does not touch the bottom of the pot. Meat, usually lamb or mutton, is wrapped in maguey leaves and placed inside the pot, then topped with the animal’s stomach, into which has been stuffed the other edible organs and a mixture of herbs, spices, and chiles. The oven is covered with a metal sheet and a layer of fresh earth, then left overnight for the meat to cook undisturbed. When uncovered, the organs (often called pancita de barbacoa) and the leaf-wrapped meat are perfectly cooked to tender, moist goodness, and the liquid has turned into a delicious soup. Frequent partakers of this rustic culinary masterpiece often do justice to all three parts, starting their meal off with a small bowl of the brothy soup (called consomé), followed by tacos made from the internal organs and finally tacos made from the meat itself wrapped into soft corn tortillas. Flautas or tacos dorados are also often to be found at these feasts. Corn tortillas are wrapped around a portion of shredded barbacoa meat and fried or deep fried until golden. These are served topped with onion and cilantro, cream, guacamole, and/or a variety of spicy Mexican table sauces. While the above-mentioned type of preparation—or one similar to it— is common to a large portion of the country, each region of Mexico has its particular way of making barbacoa. The variations are endless, and they can consist of the type of meat used, the type of condiments, the material used for wrapping the meat, and/or the baking/steaming process itself. 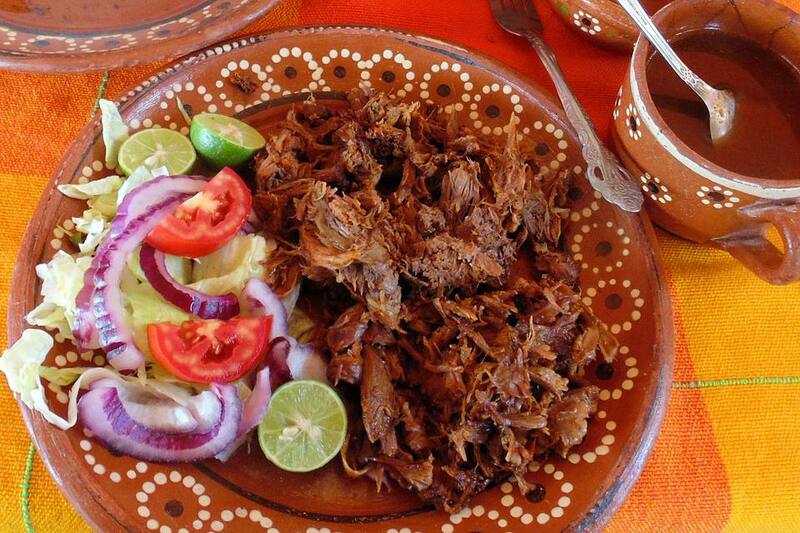 Goat meat and beef (especially the animal’s head) are used in many places in Mexico for this delicacy. Venison is sometimes made in barbacoa style in the northern state of Sonora, while chicken is common in some parts of Guerrero State. Iguana, turkey, rabbit, and other meats are also favored in particular locales. The condiments used for barbacoa are also equally diverse, depending on location. The vegetables, herbs, and spices run the gamut from naturally sweet orange juice and cloves through a variety of different fresh and/or dried chile peppers, all the way to bitter-tasting herbs and vinegar. The meat is wrapped in banana leaves instead of maguey leaves in some places. Cooking methods also vary in different locations. Barbacoa can be steamed in a large stove-top pot, or roasted in a regular oven. What all barbacoa has in common, however, is a long, slow cooking temperature and an end product that is soft, easily shredded, and has not lost its natural moisture. Like several other relatively complicated-to-make traditional meat dishes such as birria and menudo, barbacoa is not everyday Mexican fare. It is generally to be found at one of the following three venues: unassuming mom-and-pop restaurants or market stalls that sell barbacoa as breakfast, brunch, and/or dinner on weekends; communitíes that come together to prepare the dish as a group (for their town’s patron saint celebration, for example); and party halls or private citizens homes where a caterer has been hired to serve barbacoa at a wedding, quinceañera party, or other grand social occasion. Despite its rustic ingredients, appearance, and preparation, barbacoa is considered a delicacy, a treat, a special-occasion food.